The Supreme Person appears in many forms and at many times. Perhaps His most misunderstood incarnation of all is the half-man, half lion Nrsimhadeva (nri-SING-ha-deva). Nrsimhadeva appeared in the distant past to save His devotee, the boy-saint Prahlad (pra-LAHD), from torture and death at the hands of the despotic king Hiranyakashipu (hi-rahn-ya-KAH-shi-pu), who was also Prabhlad's father. Hiranyakashipu had performed extreme austerities to gain the benediction that he would be protected from death in almost unlimited ways. Because he was so wicked, however, especially in his treatment of the Lord's devotees, Krishna personally came and killed Hiranyakashipu in a way no one could have imagined. - Eons ago a wonderful incarnation of God revealed the relation between divine anger and transcendental love. - Appreciating Lord Nrisimha’s actions requires a well-rounded spiritual education. - When we carefully study the activities of the Lord’s incarnations, we’ll find them to be the highest expressions of love, no matter how violent they may seem at first glance. - Photos, articles, music, mantras, lectures, and more. It's a dream come true for Nrisimha devotees. Ahovalam Revisited—Follow a young devotee of Lord Nrsimhadeva on his adventures visiting temples of Lord Nrsimhadeva in India. 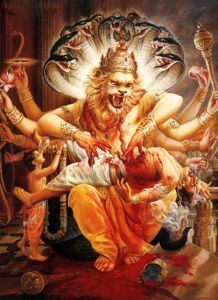 - To protect His devotee Prahlada, the Supreme Lord appeared in a form never seen before, a form neither man nor lion. Everything Nrsimhadeva—Posters, pendants, prints, photos, books, dolls, and brass statues of Nrsimhadeva, Krishna's unique half-man, half-lion incarnation. —the historical account, from the seventh canto of the Srimad-Bhagavatam, of Nrsimhadeva's extraordinary appearance and activities.